With warmer weather here in Southern California, I am in the mood for salad. I first had this salad when my Auntie Ann brought it to a family pot-luck. Everyone loved it and asked for the recipe. That was probably about twenty-five years ago, and the salad has changed with my cooking style. Auntie Ann has shredded chicken and julienne sliced kamaboko in her salad along with an oil based dressing, which I've omitted, but you can add it to yours if that suits you better. Like I said, everyone asked for the recipe! One for home and one to give to my mother-in-law. You can cut down the ingredients accordingly, or share it! The Vons near me doesn't carry House Tofu anymore, but you can get it at Nijiya Market or Marukai, or use your favorite brand. Drain the blocks of tofu first. They have a lot of water in them, I use a kitchen towel under some paper towels to drain them. I used one of the big bags of spinach from Costco. Fill a big pot with about an inch of water to boil, add the spinach and cook until just wilted. It only takes a couple of minutes. All that spinach shrinks to this amount. Drain in a colander and gently rinse for a minute in cold water or ice bath. Drain & set aside. Prepare the bean sprouts by blanching them in boiling water for 30 seconds, drain, then rinse with cold water or ice bath and drain. Cut the tofu into cubes and put as your first layer. Add some grated fresh ginger to the top of the tofu. I love ginger, so I put a generous amount. It makes the whole salad taste really fresh. Squeeze all the water out of the spinach. And chop both vertically & horizontally, so it's in small pieces. Spread a layer of spinach and then a layer of bean sprouts. Add the cucumbers as your next layer. Julianne slice the green onions also. That'll be your next layer. Add some kizami shoga (pickled ginger) to the top of the salad. It adds a nice color and gives a variation to the taste with an occasional blast of the kizami shoga. Drain any water at the bottom of the salad before serving. I like the ponzu sauce we use for shabu shabu as the dressing for this salad. It tastes fresh and has less salt than just shoyu and has no oil. Top with a sprinkling of iri shiro goma (toasted white sesame seeds), I was all out. Heat until hot, 1/2 cup salad oil and 1 tablespoon sesame oil. When hot, turn off heat, and add to this mixture, 3/4 cup shoyu and about a half of a lemon's juice. (Add the lemon to your taste. I added less than 1/2 of a lemon's juice.) Flavor with grated ginger. Cool. 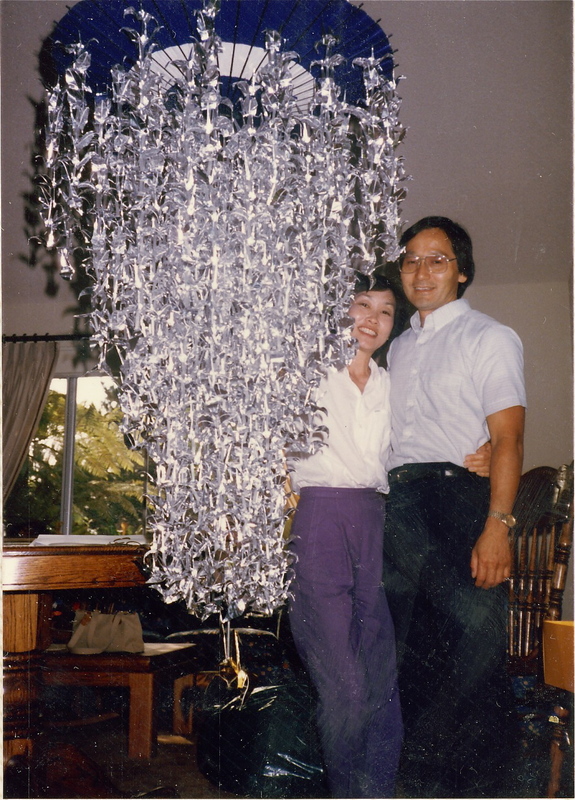 with the 1000 cranes we made for their wedding. I like the picture of Auntie Ann and Uncle Shig very much. I like looking at old family photos. I like hearing about your family. And I like the salad, thinking about making it.